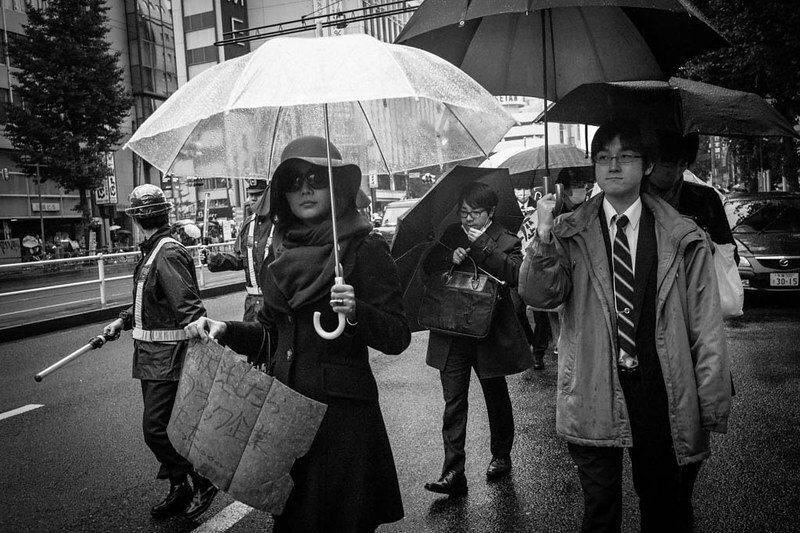 The many umbrella designs in Tokyo are captivating. 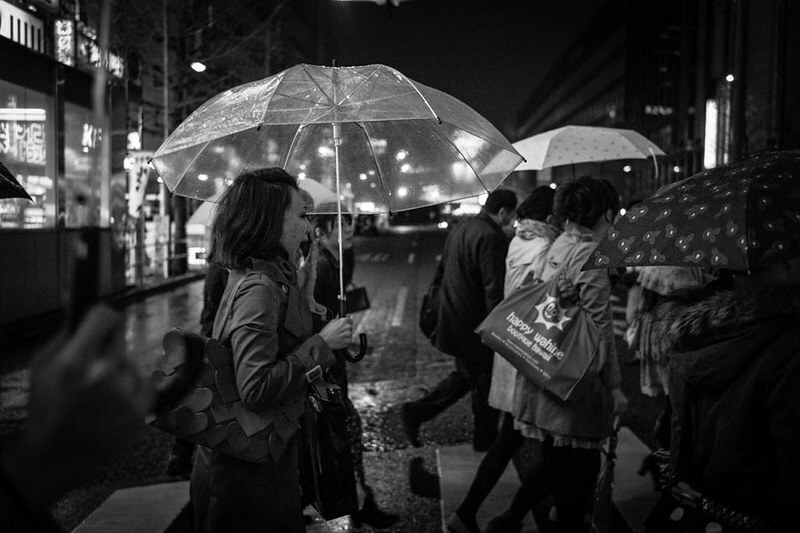 Here a lady with a fancy umbrella walks in the rain in Shinjuku. “Some people walk in the rain. 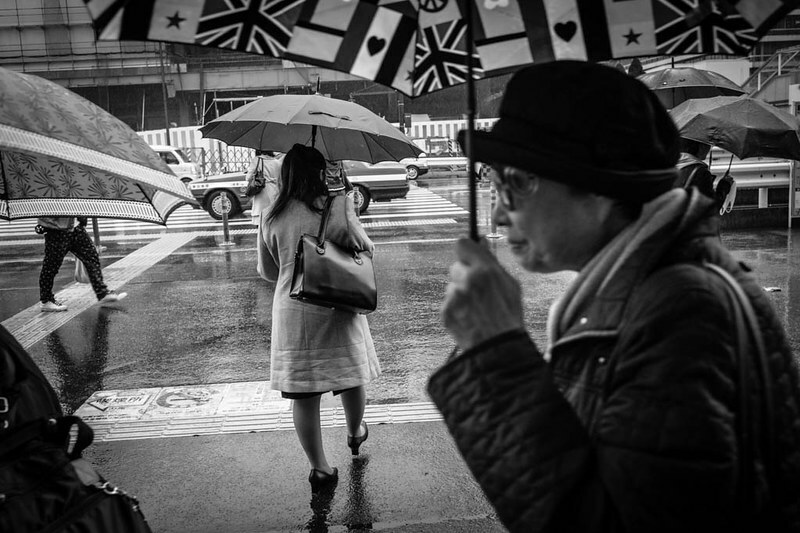 Others just get wet” – Roger Miller couldn’t have described more aptly the feeling of walking in the rain in Tokyo for me, where it seems to rain whenever I am there, whether it’s in the cold autumn season, bright cheery spring or the rainy summer months. To many in Singapore, rain is a deterrent to going outdoors, an excuse to sleep in, to hole out in the warmth of one’s abode. Many put aside their cameras, waiting for better light and weather to take pictures. Man with umbrella at night in Shinjuku. 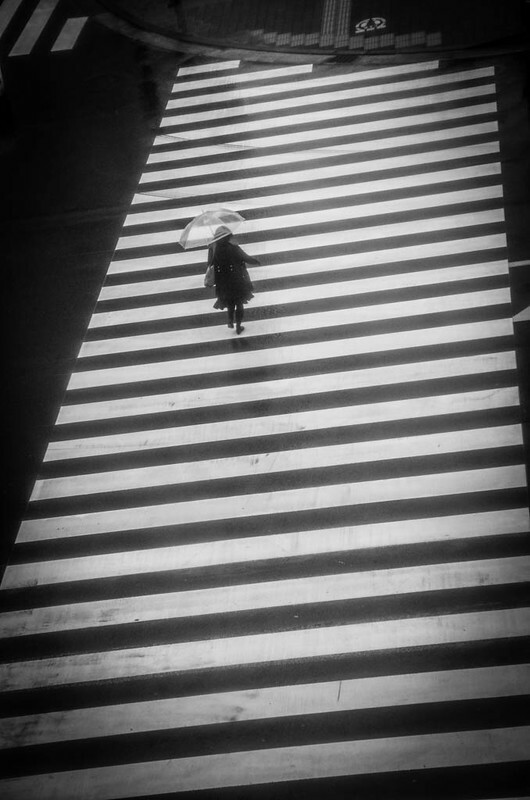 Transparent umbrella and a zebra crossing. I was most fascinated with the transparent umbrellas of Japan during rainy days. 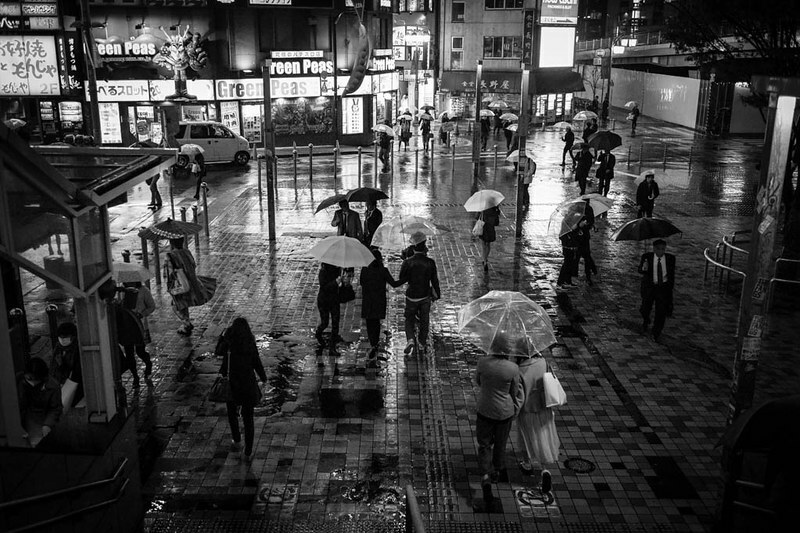 A rainy scene in Shinjuku. 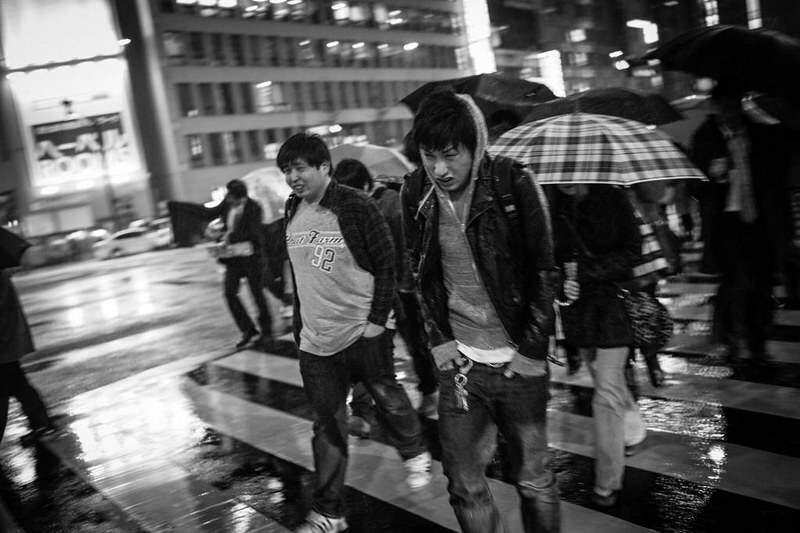 A group of protestors walking in the rain on the streets of Tokyo. In Japan, there was no such excuse for me. 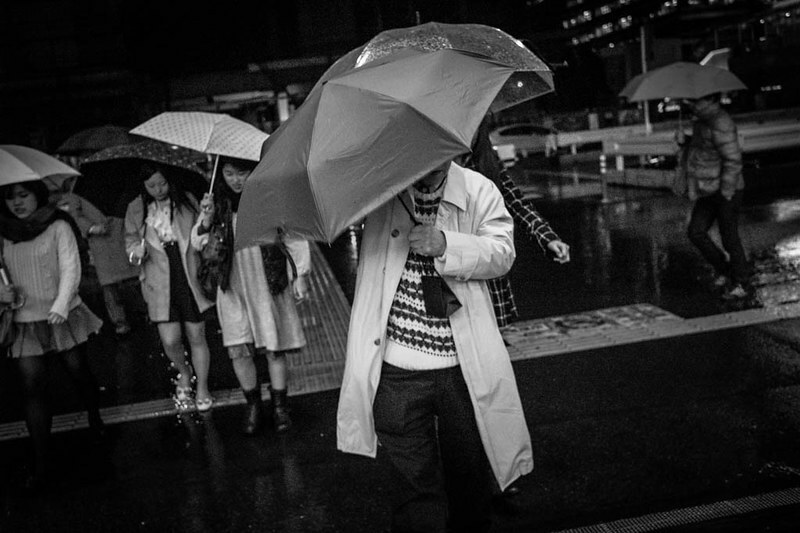 In fact, inclement weather is one of the best condition to photograph, and in Tokyo it rained so often when I was there that I simply cannot afford to rest. 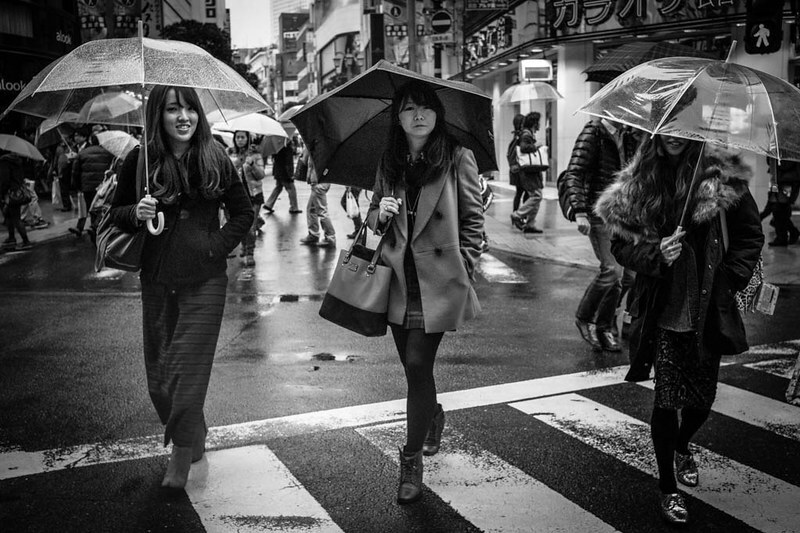 Rainy days in Tokyo have become my favourite days to photograph. 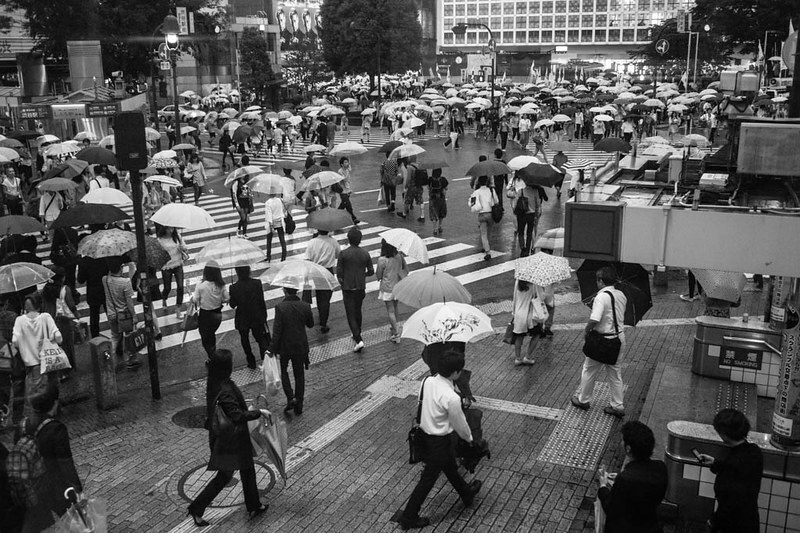 Compared to the tropical torrential rainfall in Singapore, rain in Tokyo is lighter, without the heavy raindrops that one finds in Singapore – some days in Tokyo, especially in the colder winter months, I could hardly feel the rain. 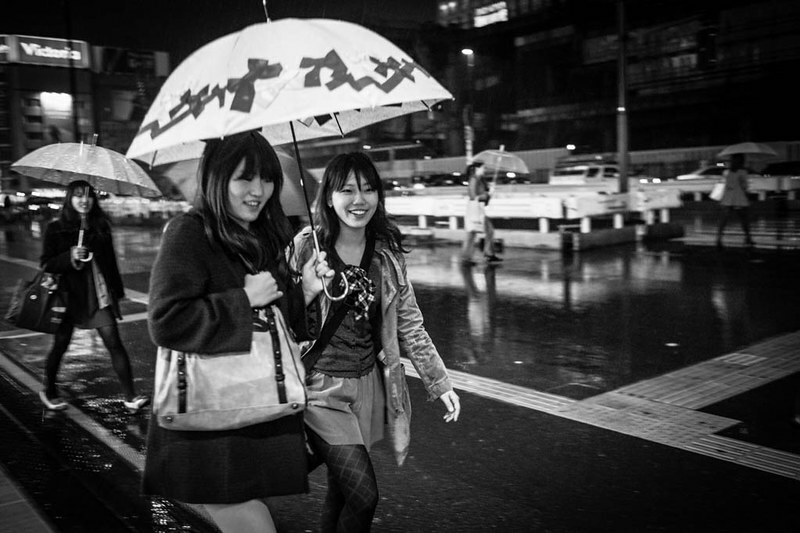 Three friendly ladies with umbrellas walking in the rain. A canopy of umbrellas covering Shibuya Crossing, Tokyo. Crossing the street in Shinjuku. 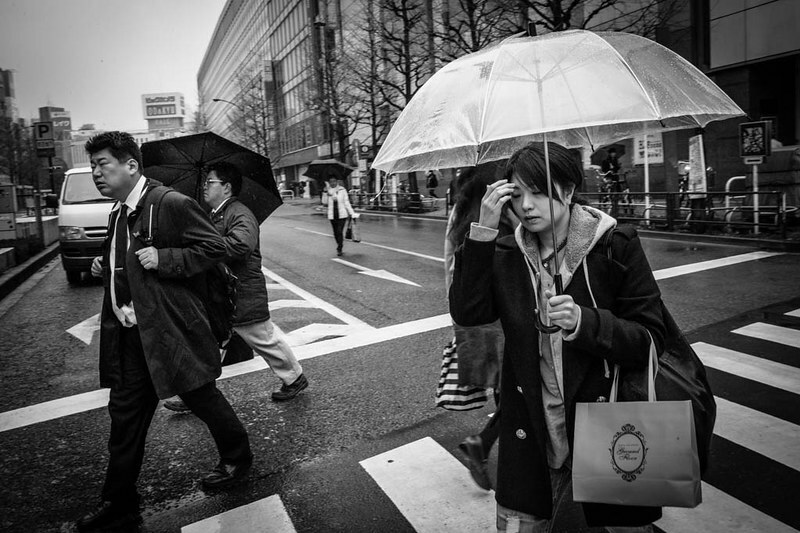 A woman with a transparent umbrella yawning as she crosses a road in Shinjuku. 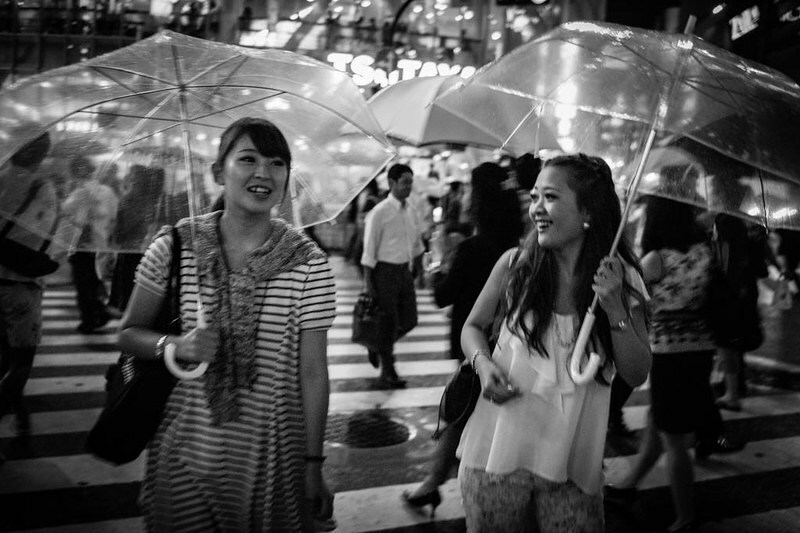 Two girls chatting in the rain with transparent umbrellas. A six way crossing in Shinjuku, somewhat similar to Shibuya but on a much smaller scale. Initially I didn’t have an umbrella in Japan, so most of the time I walked in the rain (and to be honest, it was hard to photograph while trying to hold an umbrella), enjoying the cool, and sometimes chilly weather. It was a romantic feeling, except that I was alone. Charlie Chaplin once said “I always like walking in the rain, so no one can see me crying” – and in a sense, the rain helped me in Japan in the earlier months, while I was in a more depressed and contemplative mood, and yes, the constant rain became a reason to indulge in the emo state! I was hardly singing in the rain in my state of mind, but it was somehow therapeutic walking in the rain, and to be honest, I enjoyed it immensely, even if it was terribly cold and wet! 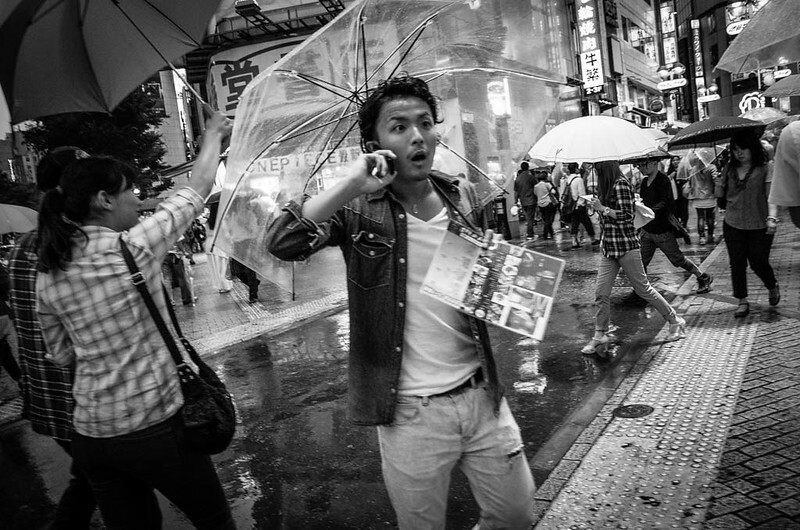 Man with transparent umbrella on the phone at Shibuya crossing. 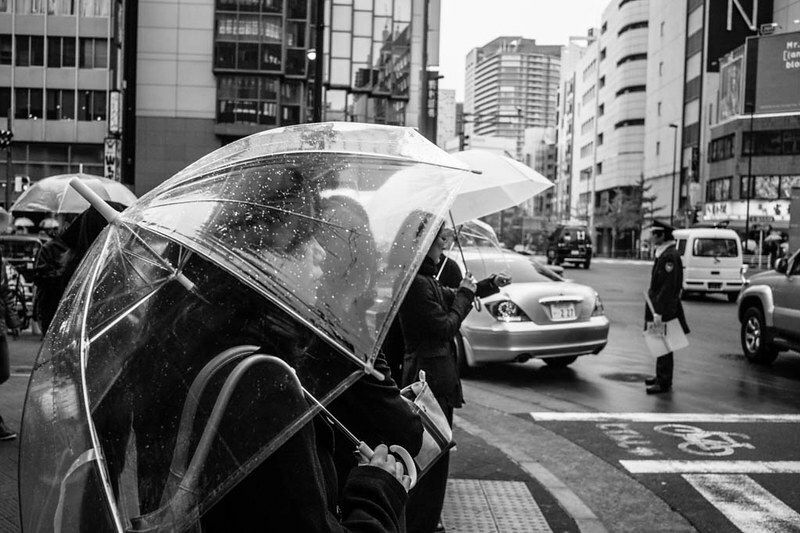 The transparent umbrella is a hallmark of Tokyo for me. A little girl dictating which direction to go. 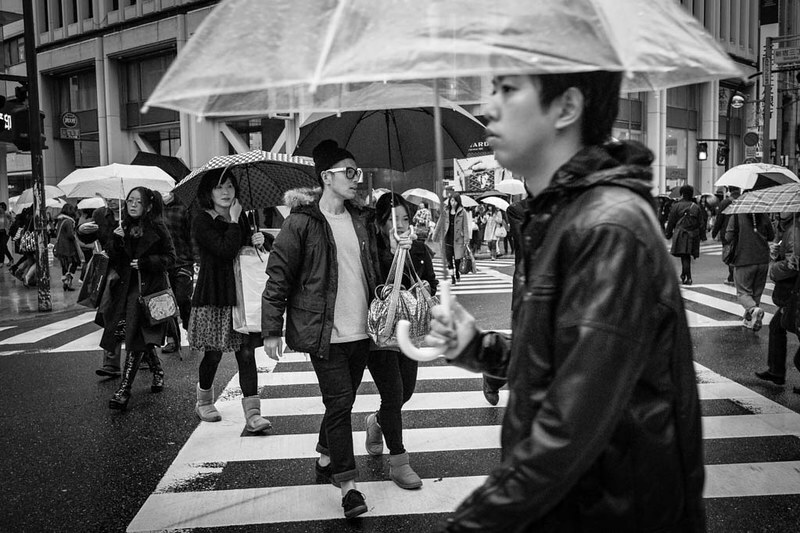 Getting cold and wet in Shinjuku. If rain was the depressant, the camera was the antidote – the sight of everyone bringing out their brollies, the constant buzz of life on the streets, the sound of rain and traffic, the cacophony of chatter in the rain – I was totally immersed in it all. It was at once atmospheric when people brought out their brollies – I was most captivated by the transparent umbrellas one finds so often in Tokyo – I was so enamoured of them that over the course of four trips, I ended up buying and bringing two of them back to Singapore. These umbrellas will do nothing to keep out the tropical heat in Singapore, but they are oh so cool when I whipped them out! 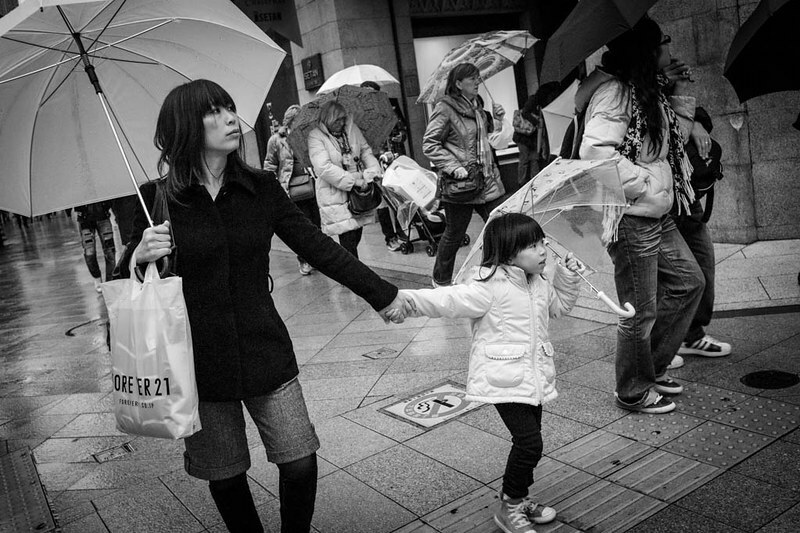 Sharing an umbrella in Shinjuku. 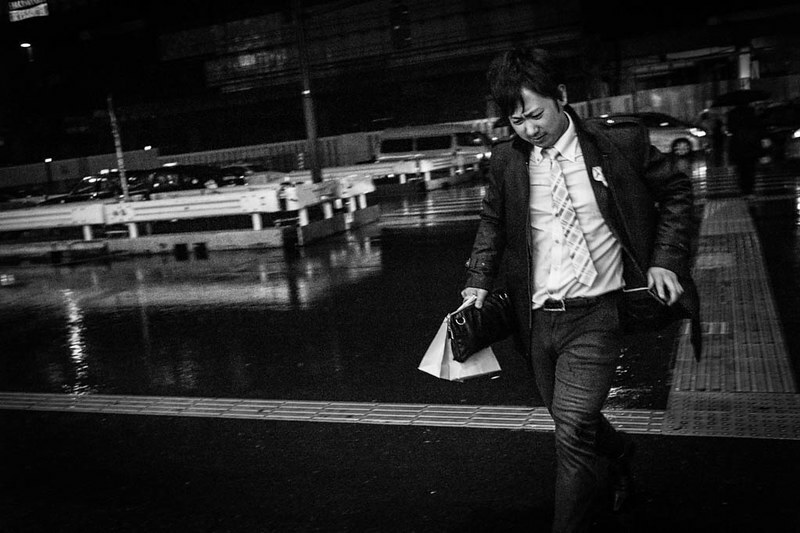 A man races across the road to shelter in the rain at Shinjuku station. 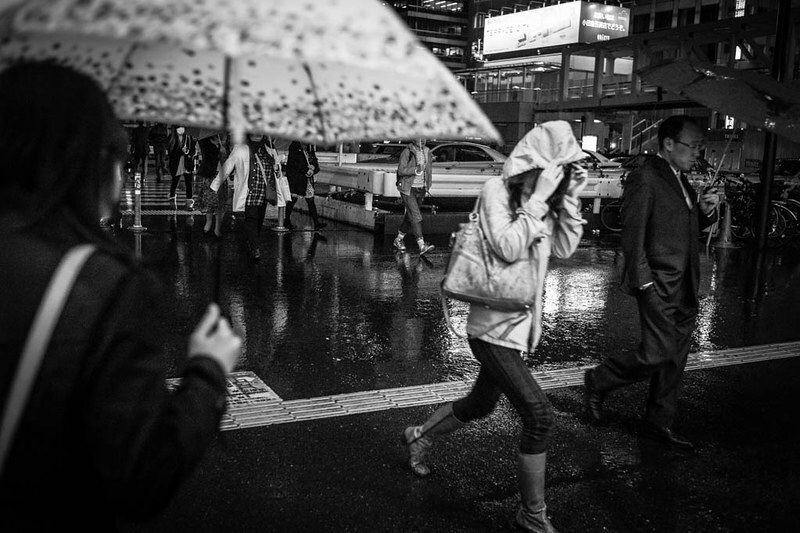 Running in the rain – Shinjuku. It was raining heavily today in Singapore, and at one stage I had to walk in the rain because I didn’t have an umbrella. I immediately missed Tokyo, and decided to make Part 5 of this post on Tokyo Dreaming, trying to include new pictures which I have not previously posted. 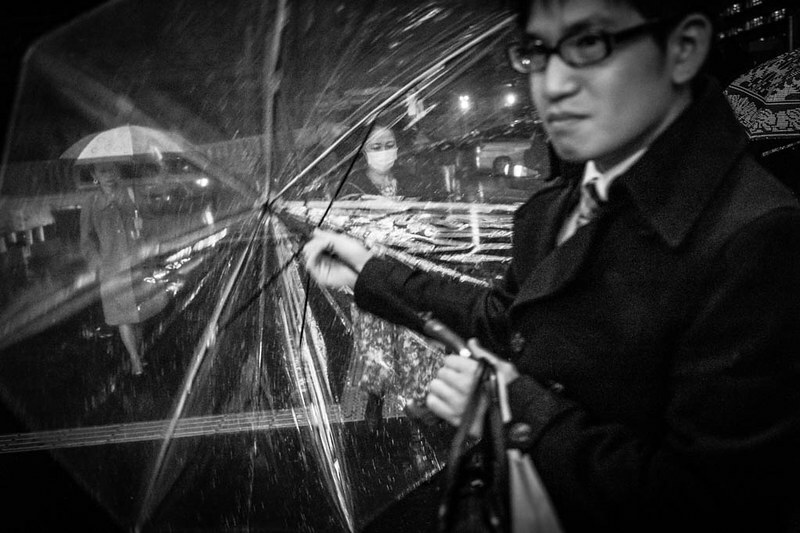 Indeed, shooting people with transparent umbrellas have become a theme within a theme of sorts for me. I hope you will enjoy the pictures here as much as I enjoy getting wet while photographing them. 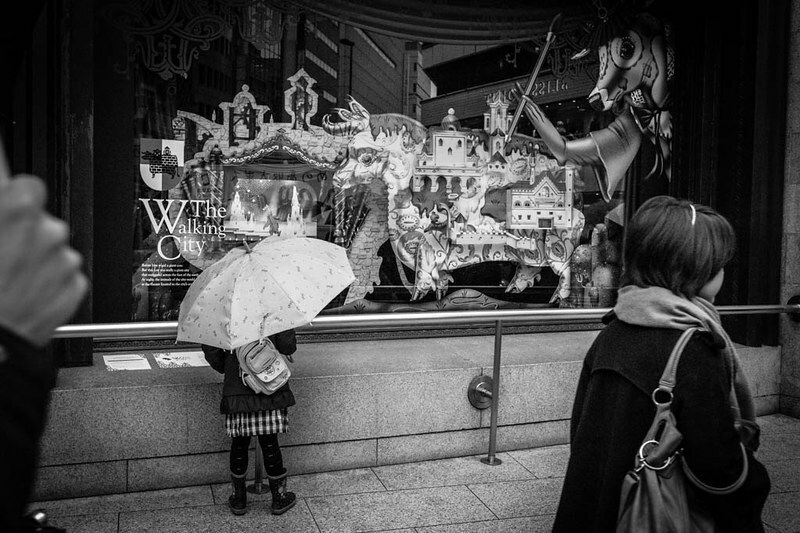 Little girl with umbrella at a store window. 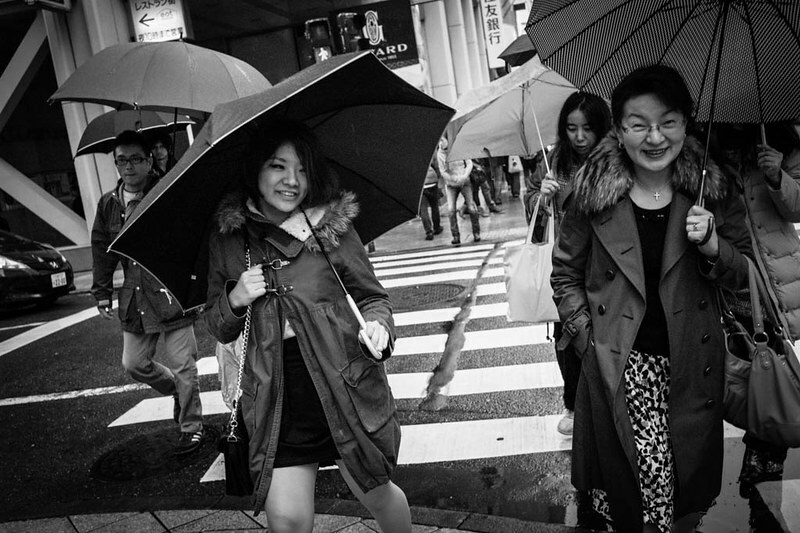 Despite the cold and wet weather the people of Japan were amicable and friendly on the streets! 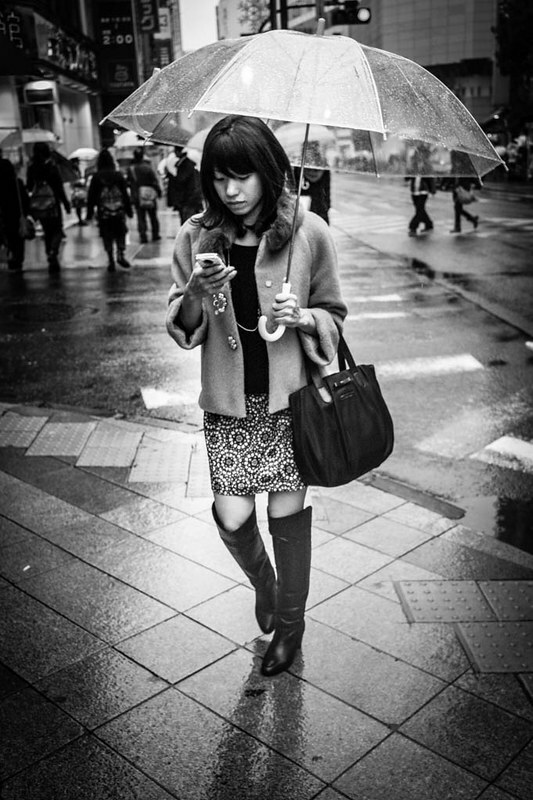 Texting in the rain – Shinjuku.